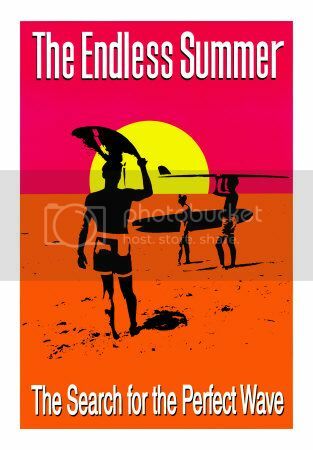 The charming, hypnotic documentary, The Endless Summer, features a lot of surfing. Surfing. Surfing Surfing. It also features a pair of globe-trotting 1960s Californian surfers, Mike Hynson and Robert August, as they paddle their way out from Senegalese, Ghanaian, South African, Australian, Kiwi, Tahitian and Hawaiian beaches: always and forever in search of the "perfect wave". In the meantime, director/writer/narrator Bruce Brown provides a Beach Boys-esque commentary: sly asides, self-deprecating humor, complete political incorrectness ("Sharks and porpoises in South Africa," Brown notes while filming a pod of porpoises behind the surfers, "have yet to integrate."). The boppy 1960s music, mixed in with some questionable stuff meant to sound "tribal", along with Brown's cavalier painting of surfers as hubris-filled daredevils to be revered - all of this sounds like it would make the 1.5 hour film excruciatingly narrow and kind of annoying. Instead, thanks largely to those soothing shots of surfer after surfer after surfer, as well as those meditative, lingering shots of a slow sunset, or those beautiful moments using a camera on the board, or the smashing waves in Tahiti: it's all very beautiful. And fascinating. Fascinating because of the sheer adventure of Mike and Robert, as they paddle around, always in a boppy good mood, assessing the water temperature and perfection of the curl. In Lagos, Nigeria, Brown notes that the air and water are so hot, it almost "melts the wax off the boards". Near Durban, South Africa, the boys find the "perfect wave" - little "pipelines" of water, curling smoothly and perfectly from a promised seven miles away. Brown notes that these waves provide surfing so lengthy that you have a "nervous breakdown". "It's the kind of wave," Brown says, "that makes you talk to yourself." The physicality, naturalism and pop mysticism of the sport bubbles under the surface throughout this film, perhaps explaining its status as an enduring classic. What is it about surfers? Why do we all like them? Why are they so Zen? They always seem to have predilections towards spirituality, especially the really laid back kind. Or did we absorb that awful-yet-nostalgically-wonderful surf spirituality feel-good teen flick, Airborne, way back in the day? And is that why we can forgive them anything? Suffice to say, despite the grating treatment of poverty by Brown (Africans are "natives", ready to "massacre" each other; Australians are "local residents"), as well as the increasingly dodgy boasting (Brown jokingly emphasizes all the various ways surfers can die), this film is... well, definitely appealing. It's also a perfect little gem of American history: what it was like to surf in the 1960s; what that south Californian landscape that The Beach Boys later immortalized (and Weezer later post-modernified, or proto-hipsterized, or whatever) looked like, as described and shot by people from that place. Gnarly, man. I've been curious about this movie for ages! I'm glad that you thought it was good. That's pretty much all I need to see a movie! Aw thanks, b! You def need to check it out. It's adorable!